Nili Carasso presents a number of works in bronze inspired from this eternal and endless source of inspiration which is the Scripture. She shows a remarkable ability to penetrate this world of the Bible, from which she extracts, with intelligence and talent the most significant models of our people: David, Miriam, and Bat-Sheva. The sculptor doesn't use the "group approach" in order to render the personality of her hero - the way she imagined it - but concentrates on the single character in an effort to detect his/her innermost psychology. She seems to have a real call for rendering the biblical characters. None of them has a static appearance. On the contrary, the movement bestowed upon each figure seems to be in direct relationship with its personality. The finesse of the lines and the skill of the execution help the viewer to make the jump into the world of our ancestors. This is not an easy accomplishment since each of us has a very different perception of the ancient world. 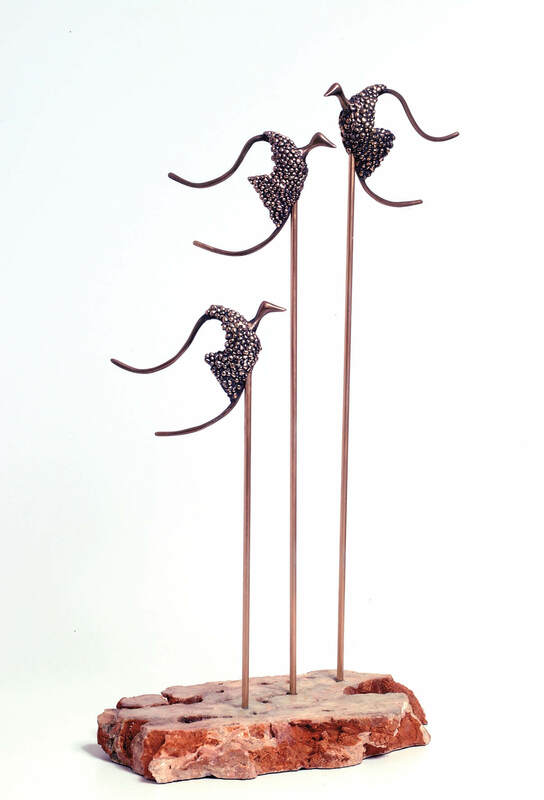 Nili Carasso went beyond the human characters to create birds, constructing a world to which each and all of us can feel close. As we walked along these sculptures, we re-created - with the help and the guidance of this sensitive artist - our own vision of the world of the Bible. Dr. Paul Leibovici in Vista Nostra Friday July 5, 2002. 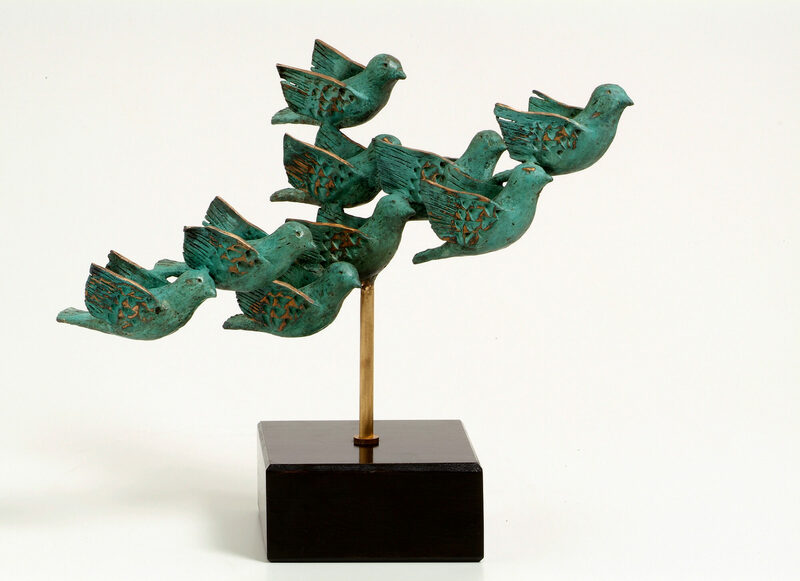 Nili Carasso's bronze sculptures articulately express her unique personality, her love of humanity and family, and her close personal bond to her legacy and tradition. Her topics involve people, their emotions and the relationships between them. The shapes and designs of her figures, with heads that are usually devoid of facial features and that are small in relation to the size of the body, render these characters truly unique and serve to emphasize the artist's distinctive perception. The artist is not merely trying to mimic reality, but rather, to create an artistic reality of her own. The figures somewhat resemble those in the paintings of Giorgio De Chirico, the Italian artist who was one of the founders of the surrealist movement (pittura metafisica), as well as those in the paintings of ultra-Orthodox artist, Moshe Rosenstein. The most prominent qualities of the sculptures are: movement, flow, dynamics, an emphasis on combination between smooth areas and various textures, as well as the colorfulness of the surface area. Although most of the sculptures are made of bronze, some appear to be made of marble, stone, wood and other materials. This originates from the patina used by the artist to paint the completed sculptures, which consists of the process of covering the surface, cauterization, covering with wax and the final polishing. Some of the sculptures are morphologically related to sea and aquatic creatures, even though this was not necessarily a deliberate association on the part of the artist. The woman that appears in these sculptures is a large woman, one who projects confidence and is full of love. The couples tend to create their own unique dance in space. Nili Carasso's dance of life is one brimming with faith, motion and hope. Nili Carasso was born in 1951, in Jerusalem. In her private studio, Nili sculpts using various materials including clay, aluminum, plaster, concrete, brass, and bronze.